Finance is the study of value and how it is determined. Individuals, small businesses and corporations regularly make use of value determinations for making strategic decisions that affect the future outcomes of their endeavors. The importance of accurate valuations cannot be overestimated; valuing assets too highly will lead to investing in assets whose costs are greater than their returns, while undervaluing assets will lead to missed opportunities for growth. In some situations (such as a merger or an acquisition), the outcome of the decision can make or break the investor. The need for solid financial skills has never been more pressing than in today's global economy. 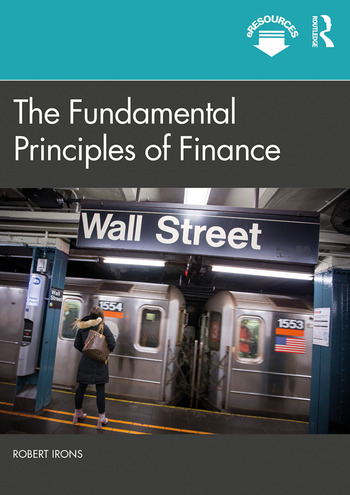 The Fundamental Principles of Finance offers a new and innovative approach to financial theory. The book introduces three fundamental principles of finance that flow throughout the theoretical material covered in most corporate finance textbooks. These fundamental principles are developed in their own chapter of the book, then referred to in each chapter introducing financial theory. In this way the theory is able to be mastered at a fundamental level. The interactions among the principles are introduced through the three precepts, which help show the impact of the three principles on financial decision making. This fresh and original approach to finance will be key reading for undergraduate students of; Introduction to Finance, Corporate Finance, Capital Markets, Financial Management and related courses as well as managers undertaking MBA’s. Robert Irons, Ph.D., is Associate Professor of Finance at Illinois Wesleyan University, USA. He has taught undergraduate and MBA students for over twenty years, and is published in numerous academic journals including the Journal of Investing and the Journal of Portfolio Management. Prior to teaching full time, Dr. Irons worked as a financial analyst for such firms as AT&T and United Airlines.